We were determined to carry through with our mission. After a quick search on Google, luckily we found an oriental market only a few miles away. Our list comprised the necessary components: short grain rice, seasoned rice vinegar, roasted nori, fresh avocado and salmon. Check! I already had toasted sesame seeds in the spice cabinet as well as a fresh cucumber in the fridge. Sushi originated in Southeast Asia as a method of preserving fish. Raw, cleaned fish would be pressed with layers of rice and salt. After months of fermenting, the layers would be preserved and ready to eat. Narezushi, as it is known, has a distinct and strong flavor, contrary to what we identify as sushi today. In the 18th Century, Hanaya Yohei developed what we commonly refer to as the modern idea of sushi, pressing fish on small pads of seasoned rice and served as fast food for the masses. There are three kinds of sushi: nigri-sushi (hand-formed sushi) is the most commonly known, consisting of a small rectangular or oval shaped pad of pressed rice with a neta, or topping; maki-sushi (rolled sushi) is a cylindrical roll formed by wrapping nori (seaweed) around rice and one or more fillings; temaki-sushi (hand-rolled sushi) is a cylindrical sushi made with nori, rice, and fillings, rolled by hand, usually containing stronger flavored ingredients. Some people refer to maki-sushi as a Japanese burrito, while temaki-sushi would be a Japanese taco. Ironically, my first taste of sushi was during the last months of pregnancy with Brenna. Maybe that is the reason she loves it so much! ﻿﻿﻿﻿Coco Chanel was so right... Fashion is not something that exists in dresses only. Fashion is in the sky, in the street, fashion has to do with ideas, the way we live, what is happening. The ivory envelope was jumbled amid a slew of advertisements, catalogs, and bills. Recognizing the envelope's handwriting immediately, the rest of the posts were clumsily dropped onto the glass table. It was another note from him... This letter was all that mattered at the moment. "On more then one occasion, long after I had set down your card, I happened to touch my hand to my face and I was immediately reminded of you by the sweet aroma that stayed upon my fingers... Even now I am haunted by the fragrance as the card sets upon my desk." Have you ever received a love letter? In this era of e-mails, texts, and smartphones, such an experience is rare but so well worth receiving. Smiling, rereading sections, the experience of every individual is unique, but some things in love never change. Throughout history lovers have tried to capture in letters the elusive quality of love itself. From the selection of the paper, or perhaps the image depicted on the card, and slant of the handwriting, every detail captures the most intimate feelings of the sender. While we have seen a current surge of sexting echoing in a new era of intimate correspondence, the sublime seduction of demure conversation in handwritten missives allows entrance into the drama of emotion, sharing the idiosyncrasies and universalities of passion. The detached acronyms and texting shorthand leaves much to be desired compounded with instant gratification. Wasn't there a time when anticipation of that deferred pinnacle heightened the entire intimate experience? Two books I have in my home library are Love Letters An Anthology of Passion and Famous Love Letters - Messages of Intimacy and Passion. Both are filled with actual reproductions and facsimiles of romantic correspondence through the ages. Break the seal, slip out the contents and unfold the delicate paper of each entry. Biographies for both sender and recipient accompany the love stories. Words in passages of longing, exultation, desire, obsession, tenderness and passion span 2000 years of history and circles the globe, proving that love is genuinely the universal language. 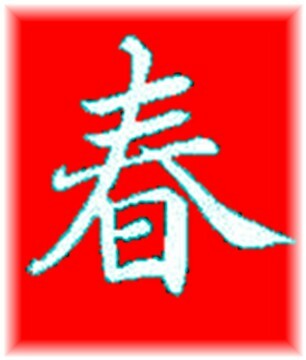 I later learned that was the Year of the Dragon, a symbol of good fortune and health, energetic, inspiring confidence and trust. What better time for my first experience in the Orient! Millions of people around the world will celebrate the Year of the Rabbit beginning February 3, 2011. The rabbit is the fourth of twelve animals associated with the Chinese lunar calendar, in continuous use for centuries. It predates the International Calendar (based on the Gregorian Calendar) in use at the present, which goes back only some 430 years. People born in the Year of the Rabbit are said to be sensitive, cautious, and lucky. Chinese New Year is the most important festival in Chinese culture. It is celebrated on the new moon of the first month according to the lunar calendar, and is a time for family reunions and scrumptious feasts. Primarily celebrated by people of Chinese, Korean, Vietnamese, Tibetan, and Mongolian heritage in many parts of the world, the occasion is marked across a diverse array of cultures. Countless parades, parties, and other special events are common. Chinese New Year is a chance to leave the problems of the previous year behind. It is important to start the New Year fresh, and this means cleaning up the house and buying new clothes. Houses are decorated with red paper banners which have auspicious couplets written on them. These are hung around doorways and are intended to bring luck to the household for the coming year. Red is an important color in Chinese culture, symbolizing prosperity and good luck and is supposed to ward off evil spirits. Many people will wear red clothing during the New Year celebrations, and houses will have many red decorations such as Chinese knot work. Little ornate red envelopes or "lucky envelopes" are distributed with money and regarded to be very opportune gifts. Sweep for success - clean your house from top to bottom. Dress for the occasion - buy something new and wear red which is considered lucky. Even add luck to your menu - prepare a whole fish for dinner, symbolic of progress, togetherness and abundance.